When scientists and engineers at Hydroid set themselves the task of designing one of the most compact autonomous underwater vehicles (AUVs) ever produced, they collaborated with Nortek to provide high-quality navigational equipment capable of fitting such a small form factor. Hydroid has built on REMUS AUV technology – first developed at the Woods Hole Oceanographic Institution in Massachusetts – to become a leading manufacturer of trusted, field-proven lightweight AUVs for underwater search and survey. Acquired by Norwegian technology firm Kongsberg Maritime in 2008, the company manufactures AUVs suitable for a range of subsea conditions, from those capable of diving as deep as 6000 meters to those that can hover in shallow, hazardous areas where navigation is difficult. Hydroid’s latest challenge was to create a compact, portable AUV capable of single-person operation that would open up new possibilities for deployment. 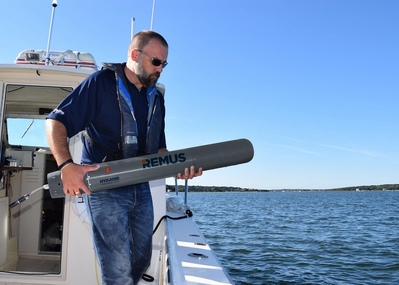 The result is the REMUS M3V, an AUV whose dimensions have been kept down to a true “A-size” form factor – it measures just 36" by 4.875" (0.91 m × 0.12 m). The compact size of the M3V makes it ideal for many applications, such as marine life research or underwater assessment around infrastructure such as oil and gas installations, offshore wind turbines and military applications. Hydroid hopes that the REMUS M3V’s size will open up new avenues for deployments beyond mine-countermeasure (MCM) activities where REMUS AUVs are already in use. The A-size form factor also means the REMUS M3V can be launched from the air, on the surface and even submerged below the sea. That makes it useful for applications such as oil spill response. To maintain the A-size form factor, Hydroid needed to use navigation technology that was as compact as possible, while also maintaining the levels of quality and accuracy expected of its products. This entailed miniaturization and the most compact arrangement possible of components within the tube, as well as stripping off appendages such as fins from the outside to provide a hydrodynamic, streamlined form factor. The REMUS M3V includes a powerful thruster, which enables it to cut through strong ocean currents – it can achieve speeds of up to 10 knots or more. Navigational accuracy of onboard equipment is crucial to the operation of AUVs, given they are untethered vehicles that must be able to find their own way to and from their targets. To that end, the REMUS M3V needed to include small-form Doppler Velocity Log (DVL) sensors and related equipment to help accurately measure the AUV’s velocity and altitude relative to the seafloor. Here, Hydroid was able to work with Nortek to provide the solution they needed. “The ability to customize the design of the Nortek DVL enabled us to get this technology inside the A-size form factor, while being able to support operations down to 300 meters depth,” says Graham Lester, Hydroid’s Senior Vice President of Sales and Marketing. The DVL is one of the key pieces that permit autonomous navigation, and Nortek has provided a mechanically tightly integrated DVL for Hydroid’s next-generation REMUS M3V AUV. “The challenge was to provide a hardware platform that fit into the tight physical constraints of the REMUS M3V while being mindful of optimization for size, weight and power (SWaP),” explains Torstein Pedersen, DVL Product Manager at Nortek. 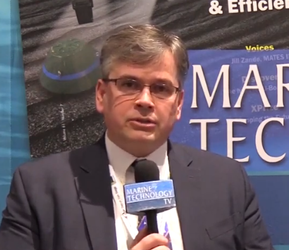 Graham Lester says Hydroid’s reputation rests on the proven reliability and track record of its REMUS AUVs and the software used on them. The company needed to use DVL technology that customers would trust to assess velocity and altitude above the seafloor. That was one of the main considerations when selecting Nortek’s tried-and-tested DVL technology. Hydroid ran comparative “offboard” tests of the Nortek DVL1000 against systems from other manufacturers, attaching them to a rig at sea. Hydroid also brought in Dr. Øyvind Hegrenæs, a Principal Engineer and Navigation Solutions Product Manager from Kongsberg Maritime in Horten, Norway. “After having tested of one of Nortek’s other DVLs, the DVL500, his conclusion was that Nortek’s DVL500 had a comparable or better accuracy than more expensive alternatives, as well as some nice features like outputting figure of merit data,” Lester reports.